The history of downtown Covington has a cadence not unlike many Southern towns. It began with a collection of rudimentary buildings surrounding the Square, advanced to a town with governmental and judicial structures and then established its role as a market and commercial center with arrival of the railway. Wars both domestic and abroad, fires, the development of the automobile and the rise and fall of cotton production created necessity and opportunities for rebuilding that carried Covington into the early decades of the 20th Century. From an increasingly resourceful and able business class in the 19th Century emerged a group of community leaders empowered with a sense of common good. Long before “quality of life” assumed the cache it now enjoys these citizens challenged themselves to provide a range of services and an environment in the downtown that would be of benefit and use to all. Covington’s establishment as the judicial and government center of the county, its economic diversity, and its civic leadership, has built a sound foundation for the future of the downtown. 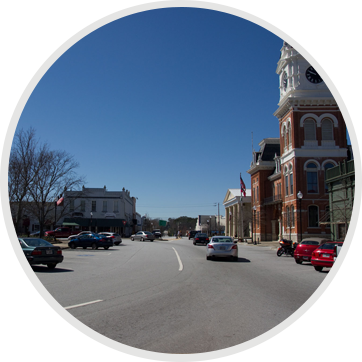 Downtown Covington of today is a vibrant downtown, which is a source of pride for the community. It has a unique blend of shopping and dining experiences; its beautiful historical buildings are centered on the green oasis of the Square Park where on many occasions a wonderful concert or community event could be taking place. Downtown Covington is a great place to experience. Copies of Main Street, Covington From its Creation to Modern Times by Peggy Lamberson may be purchased at the Main Street office. Covington’s downtown Square is bustling with specialty shopping and unique dining opportunities. The district enjoys a long tradition of family owned and operated businesses and an impressive events calendar that truly showcase the best of small town America.